Saudi Arabia offered an explanation early yesterday for what had happened to journalist Jamal Khashoggi in Istanbul, 17 days after he went missing at the kingdom’s consulate in Istanbul. 1Was Jamal Khashoggi really considering a return to Saudi Arabia? The Saudi statement said that the “suspects” in Khashoggi’s killing had travelled to Turkey to meet with the journalist as he had suggested he was interesting in returning home. However, Khashoggi had travelled to the consulate with his fiancee, Turkish national Hatice Cengiz, who has said that her partner was seeking a document from the Saudi government that would allow them to wed.
Khashoggi himself had told friends that he was suspicious of attempts to lure him back to the kingdom. “He said: ‘Are you kidding? I don’t trust them one bit,’ ” after one such attempt, according to Khaled Saffuri, an Arab-American political activist, talking to the Washington Post. 2 If this was just a discussion, why did at least 15 men travel to Istanbul for the meeting? However, Saudi Arabia says it has detained a total of 18 people for their involvement in Khashoggi’s death, and the Turkish government has linked 15 people to Khashoggi, Saudi citizens who had arrived at the consulate shortly before the journalist disappeared and who left hours later. 3Why did this Saudi group include a forensic expert and members of security forces? Again, if this was a simple discussion, it would seem unnecessary to send members of the Saudi security services. However, at least 12 of the alleged hit team identified by Turkish authorities had some kind of link to the kingdom’s security services or the royal court. One of the suspects, Salah Muhammed al-Tubaigy, was a forensic expert known for pioneering rapid and mobile autopsies. Bruce Riedel, a former CIA official and Brookings fellow who has written a book about Saudi-US relations, said this stuck out to him. “I can’t think of an alternative of why you would need a forensics expert unless you were covering up evidence of a crime,” Reidel told reporters. 4What actually happened inside the consulate? The Saudi account describes “a fight or a quarrel” in the consulate – a wording that implies a physical dispute between two sides. However, Khashoggi had entered the facility on his own and was apparently meeting a team of 15 men, suggesting at least that the two sides were not equal. Turkish officials are believed to have played to CIA counterparts an audio recording that was made inside the consulate that could shed some light on what happened. The recording could provide key clues into what happened to Khashoggi – including whether his death was intentional or whether he was tortured. 5What happened to Khashoggi’s body? 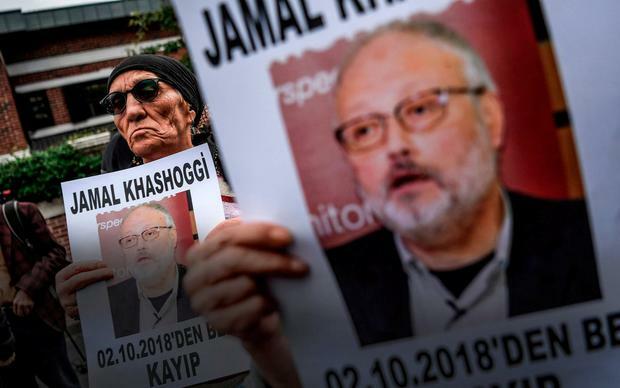 Even though Saudi Arabia now admits that the journalist died inside the consulate, their statement on Saturday did not reveal what happened to the body. Early speculation suggested that Khashoggi’s body parts may have been taken out of the country, though Turkish authorities recently searched rural areas near Istanbul. A Saudi source told reporters on Friday that the whereabouts of Khashoggi’s body were unclear after it was handed over to a “local co-operator”. 6Why did Saudi Arabia say he had left the consulate when he had not? 7How could Crown Prince Mohammed bin Salman not have known? The Saudi account makes no suggestion that the crown prince knew about what had happened to Khashoggi. Indeed, he has been tapped by his father, King Salman, to lead a commission that is designed to review and “modernize” the kingdom’s intelligence operations after the death of the journalist. The 33-year-old Mohammed bin Salman is widely considered the real power in Saudi Arabia, however, and he has led the drive to modernise the country. Some experts also say that he is behind a clampdown on free speech. “This never would have happened without MbS’s approval. Never, never, never,” a former senior US diplomat told the Washington Post after Khashoggi disappeared. Saud al-Qahtani, an adviser to the crown prince, was among those fired yesterday. He had previously been behind attempts to lure Khashoggi back to Saudi Arabia, according to US officials. After the kingdom’s announcement yesterday, a message he had written on Twitter last year was shared widely on social media. 8Are the men detained by Saudi Arabia actually the same men that were identified by Turkish authorities? The Saudi government said that 18 people had been arrested. It was unclear, however, whether these people included the same 15 suspects who had been identified by Turkish authorities. A report on the Saudi-owned al-Arabiya news channel had previously said that the 15 were “tourists” who had been falsely accused. 9Why did it take 17 days to come up with this account? More than two weeks have passed since Khashoggi disappeared. Whatever the answers to the rest of the questions on this list, it is remarkable that it took so long for the kingdom to reveal that Khashoggi had died – and that when Riyadh finally admitted culpability in his death, it did so with a story that will convince few of its critics.